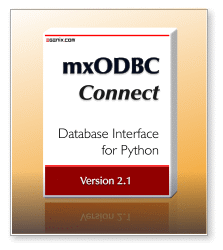 mxODBC Connect™ allows you to easily connect your Python application to remote database servers, using a Python DB-API 2.0 standard compatible interface. mxODBC Connect™ is a new client-server product from eGenix that enables fast, easy and secure access from any Python application to remote databases on your network. Unlike our mxODBC Python extension, mxODBC Connect is designed as client-server application, so you no longer need to find production quality ODBC drivers for all the platforms you target with your Python application. Instead you use an easy to install Python client library which connects directly to the mxODBC Connect database server over the network. This makes mxODBC Connect a great basis for writing cross-platform multi-tier database applications and utilities in Python, especially if you run applications that need to communicate with databases such as MS SQL Server and MS Access, Oracle Database, IBM DB2 and Informix, Sybase ASE and Sybase Anywhere, MySQL, PostgreSQL, SAP MaxDB and many more, that run on Windows or Linux machines. By removing the need to install and configure ODBC drivers on the client side and dealing with complicated network setups for each set of drivers, mxODBC Connect greatly simplifies deployment of database driven client applications, while at the same time making the network communication between client and database server more efficient and more secure. mxODBC Connect Client works on all major Python platforms. As a result, connecting from e.g. Linux or Mac OS X to an SQL Server database has never been easier. You can even keep the data sources you already have configured on your Windows machine and connect to them as if your application were running on the database server itself. With mxODBC Connect you can take full advantage of Python's cross-platform functionality without having to think about complicated client side driver setups. Connecting from Unix to SQL Server is a typical case. The only available free ODBC driver for this setup is the FreeTDS ODBC driver - but that's still far from production quality and doesn't handle Unicode at all. The commercial alternatives are all rather expensive. mxODBC Connect provides a great alternative in that it allows you to use the MS SQL Server Native Client directly on the database server. mxODBC Client API: mxODBC Connect Client provides the same interface as our stand-alone mxODBC interface on all supported client platforms. Enterprise Level Security: mxODBC Connect can use SSL encrypted connections - a feature that many database client interfaces don't provide. Full Python Support: mxODBC Connect Client works with Python 2.3, 2.4, 2.5 and 2.6 on 32-bit and 64-bit platforms - regardless of the server side platform. 32-bit and 64-bit ODBC: mxODBC supports both 32-bit and 64-bit versions of the ODBC standard - including special 64-bit builds on Unix. Easy configuration: a single INI file to configure the mxODBC Connect Server. Enterprise level security: SSL encrypted communication, certificate based server access control, username/password authentication. The mxODBC Connect Clients requires installation of our Open-Source eGenix.com mx Base Distribution. If you also want to use SSL encrypted network communication, you need to install the eGenix.com pyOpenSSL Distribution as well. Both comes as easy to install pre-built binaries. The only other requirement is a working Python 2.3, 2.4, 2.5 or 2.6 installation. On Linux, you will have to install one of the popular ODBC managers iODBC or unixODBC and then register the ODBC drivers for your database with these ODBC managers. The eGenix.com mxODBC Connect Server and Client products are made available under the terms and conditions of the eGenix.com Commercial License Agreement, Version 1.2.0 (PDF file). The mxODBC Connect Client is a free download and can be installed on any number of machines, subject to the eGenix.com Commercial License Agreement, Version 1.2.0 together with the eGenix.com mxODBC Connect Client 1.0.0 General Proof of Authorization. When purchasing a license for the mxODBC Connect Server product, you will receive a digitally signed Proof of Authorization license.txt file together with a license.py file that you need in order to provide to the mxODBC Connect Server installer. Note: mxODBC Connect Server contains a number of open-source third-party products. For details please see the mxODBC Connect User Manual and Installation Guide.The license texts for these third-party products are available in the eGenix.com Third-Party License Guide 1.0.
mxODBC Connect Server contains a number of open-source third-party products. The licenses for these are available in the eGenix.com Third-Party License Guide 1.0 . By downloading, installing or using the eGenix mxODBC Connect Server, you agree to the terms and conditions set forth in the eGenix.com Commercial License Agreement 1.2.0 and the applicable licenses terms for the included third-party product (see eGenix.com Third-Party License Guide 1.0). You will need to have one of popular ODBC managers for Unix installed on the target system: iODBC 3.52.x or unixODBC 2.2.x. We have successfully tested the product with iODBC 3.52.6 and unixODBC 2.2.12. If you want to use SSL encrypted connections to the mxODBC Connect Server, please also install the eGenix.com pyOpenSSL Distribution. By downloading, installing or using the eGenix mxODBC Connect Client, you agree to the terms and conditions set forth in the eGenix.com Commercial License Agreement 1.2.0 together with the eGenix.com mxODBC Connect Client 1.0.0 General Proof of Authorization. mxODBC Connect Client is a commercial product for which we do not make the source code available. However, the above pre-built archives do not depend on the client platform and should install on all Python platforms supported by the eGenix.com mx Base Distribution.